How much should your Morkie weigh? If your Morkie is a puppy, you might be wondering how much he’ll weigh when he’s full-grown. Or, if he’s already an adult, you might wonder if your Morkie weighs too much… or too little. Since your Morkie is half Maltese dog and half Yorkshire Terrier, it make sense that he’ll be some combination of both breeds. And coincidentally, those two breeds are just about the same size. The preference among professional judges and dog handlers, is a dog 5 to 6 pounds, although those closer to 8 pounds are very acceptable. What judges and dog professionals in general don’t like however, is a dog that is too small. More health problems. They are more sensitive to potential hazards around the house than ‘full size’ dogs of the same breed. A jump from the couch can break a leg and they can have chronic diarrhea. A super small dog faces high risks if an operation is needed, even common neutering. Very small dogs are harder to house train. Their bladders are that much smaller and owners say it takes at least 6 months to potty train a teacup. Teacups normally need a lot of attention and can’t be left alone for a long period of time. They need food more often – at least 3 or 4 meals a day, and can be very high-strung. Teacups usually have a much shorter lifespan. Most toy dogs have a life expectancy of 12 to 15 years but a teacup can live as short a life as just 5 or 6 years. Teacups are prone to Hypoglycemia or low blood sugar shock. This problem is a temporary one with any toy puppy until it grows to its full size, but with teacups that are under 5 pounds when full-grown — they always at risk of this common yet very serious problem. Hypoglycemia is caused because the small dog is not able to store enough energy (food) in its tiny digestive system. Any kind of stress can cause a drastic drop in blood sugar levels which can actually be fatal! There’s certainly nothing wrong with a larger dog, provided he’s not overweight. How can you tell? Can you feel his ribs easily through a light cover of fat, or are they difficult to feel because of thick fat? From the side view, is there an abdominal tuck beginning from base of ribs? Is there thickening at the tail base? Is your dog slow to rise or move around? Is she reluctant to exercise, or does she tire easily with activity? 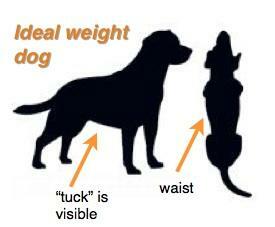 Overweight or fat dogs face many health problems. Digestive problems including constipation, flatulence and diarrhea. Phew, who needs it! Serious damage to joints, bones, and ligaments are a direct result of too much weight being borne by the joints. Heart disease and high blood pressure. Difficulty breathing – fat pushes on the abdomen wall and there is less room in the for the lungs to fill properly. 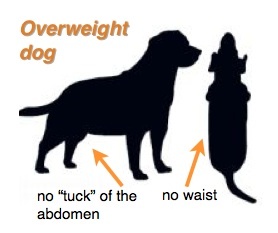 Overweight dogs often wheeze, unable to take a full, deep breath. Increased chance of cancer – could be another risk to your Morkie who’s overweight. The exact link between obesity and cancer isn’t known for sure, but why risk it! A shorter life – just like people, dogs with all the burdens overweight causes, simply don’t live as long. In conclusion, keep your Morkie fit and at a healthy weight and she’ll be a happy, lively companion for many years. My Morkie is 4 pounds 4 ounces and is almost 8 months. Is 4 pounds 4 ounces considered teacup?? Hi my morkie , Speedy is going to be 8 months on Sept 10. He weighs 8 pds. How much more you think he will gain. What is considered full grown? . My morkie is 7 weeks old and weight is 1lbs 10 ounces how much do you think he will weight fully grown? thank you! Hi! My morkie is 11 1/2 weeks old and weighs 5 lbs 4 oz. How big will she get? Thanks! Hi! My morkie, Koa, is 11 weeks 2 days, and she weighs 5 lbs 4 oz. Do you know what her estimated adult weight will be? My Morkie Peggy is 5 1/2 months old and weighs 2.6kg. How big do you think she will be? This is a add on to my previous comment referring to my Morkie-(Chip). This is Paul. I figured this journal I’ve been keeping of his weight may help you in determing his adult weight. The breeder said 5-7 lbs, but he is already 5.4 lbs at 18 weeks old. Hope this helps and thank you! My Morkie is a beautiful tri color (brown, white, and some black) puppy. He is 18 weeks old and weight 5.4 lbs. I am extremely curious to see if you could help me find out what he will weigh when he is fully grown? The breeder told us 5-7 lbs but he is already 5.4 lbs at 18 weeks, would do you think? My Morkie Emma will be 8 months next Friday & she weighs 5.6lbs. Do you know how much she will weigh as an adult?? Hi Vicki – thanks for your question! Toy dogs grow into adulthood much quicker than medium and large size dogs. Your little Morkie Emma is pretty much full grown at this point. She might gain a few more ounces, but that’s it. My male morkie is over 15 pds and 15 months old. He is very long and tall. The vet told me when you get mixed breeds you never know what size they will be !! Hey my Name is Chae I was my morkie is 1 lbs 10 once at 7 weeks old How big do you think he will be adult size ?? My morkie is 1pound 10 ounces at 7 weeks old how big do you think he will be fully grown? Thank you ! Hi! My Morkie is 2.6 pounds at almost 15 weeks how big do you think she’ll be? My Morkie (now 6 years old) weighed the same at 12 weeks old. She is now 16 lbs! The charts are nothing more than a “guesstimate”! Your’e absolutely right Kim; until the Morkie has been bred morkie-to-morkie for a number of generations, we don’t know how each will turn out, size wise, temperament, colouring and more. My little 4 pounder now weighs 18 lbs and vet says he needs to lose about a pound. He is cute as a button at 6 years old. Breeder said his max weight would be around 10 or twelve pounds if anything. Thought we were scammed on breed but found out weight is only a guess and some pups in same litter were 8 pounds max. I wouldn’t have traded my fur baby if he turned ou to be a German Shepherd! Hello my morkie Mia is 3.9lb at 9weeks old how big do you think she will be full grown . My female morkie was born 10/5/17. When we adopted her at approximately nine weeks she weighed 2.2lbs. One month later she weighed 2.8lbs and three weeks later her weight jumped to 4lbs at 16 weeks and 5 days old. That was a BIG jump in my opinion. How much do you think she will weigh full grown. I was hoping for no bigger than 6lbs. My morkie is 4 1/2 months old. He weighs 6.6 lbs. How big do you think he’ll get when he’s full grown? And when should I have him spayed? You could have him neutered now Deb; or within the next two or three months. This should discourage future ‘marking’ of your home with urine by him. I’d say he will probably be around 8 pounds full grown. That’s an excellent size. Still small enough to be a sweetie, but not too small or sickly small. Hi. We’re thinking of adopting a morkie and don’t want a really small teacup weight. The morkie on the website is a rescue but weighs only two pounds at 3 months old. How much will it weigh? My morkie is 15 weeks old and is about 2.9 lbs… how much do you think he will weight as an adult??? My Morkie is 7 months old, and almost 12 pounds! Our vet said he could get up to 15! Yes he could… probably in the range of 14 to 15 pounds. That’s a good healthy size as long as he’s not overweight. When he’s wet you should be able to see is ribs from above. How much would a morkie weigh if they are 1 pound at 6 weeks old? Hi Bri, thanks for the question. One rule of thumb is, take your puppy’s weight at 6 weeks and double it, then double it again for the mature, full grown size…..so in other words your Morkie would be just 4 pounds. Hi my Morkie is ten years old and I’ve had him since he was two. He’s put on some weight and is now 12 pounds. Family members feed him and won’t stop. His weight at two years old was 7 or 8 pounds. How can I help him lose weight? I’ve started taking him on walks but he’ll stop and I’ll have to carry him home. I’ve limited his time with my family members when they’re eating so hopefully that helps. 2. When you’re on your own with your Morkie, consider changing to a low calories version the food you’re giving him now, and /or slowly reduce the quantity you feed him. Walking him is great – keep that up and eventually he’ll be able to go longer without giving up, especially as he sheds some of those extra pounds. Good luck with your Morkie Leah, and thanks for writing! Hello. My Morkie pup, Cooper, is 4.6 pounds at 13 weeks. I was told by the breeder that he would grow between 6-9 pounds. What are your thoughts? I think that’s bang on… I’d put him at the lower end of that range, probably 6 or 7 pounds max. My morkie is 3.5lbs at 12 wks now m, about how big would you estimate her to be. 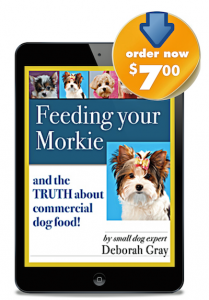 Hi Nikki – It looks like, from all the charts, that your Morkie will be between 5 1/2 and 6 pounds. Great size – small, but still healthy and sturdy. Very adorable! Your Morkie is just about at her adult weight right now… my guess is that she will not be over 4 1/2 pounds, even a little less. why do morkie’s lick so much ? Dogs licking THEMSELVES is another matter. Sometimes dogs will lick their paws a lot because of food or airborne allergies. It seems to calm them and reduce the upset the allergy is causing. However, if your Morkie’s paws are getting irritated, it’s time to put a stop to this with something you can put on his paws that tastes horrible but doesn’t harm him. Some things you can try are apple cider vinegar; Grannicks makes a good product called Bitter Apple Spray, also available as a dab-on. Here it is on Amazon. Sometimes that licking can get very obsessive; non stop for a long time, or your dog will keep going back to it after you try to discourage him. You could try an organic liquid that reduces anxiety, like SynergyLabs Richard’s Organic Pet Calm. But you may have to talk to your vet if your dog is especially obsessive, since this can indicate something else more serious at the root of the behaviour. Good luck with this Patty! Hi Savannah – By the time your Morkie is about 9 months old, he will probably weigh a couple of ounces over 4 pounds, and remain at that weight. I have a 10 month old male Morkie named Snoopy. He is already 15 pounds. Not fat. Vet says he could get to 18 pounds. Does this mean he is not a true Morkie? I was hoping for him to stay small but that didn’t happen. Love him no matter what size just makes it harder for me to pick up. Glad to hear you love your Snoopy and why wouldn’t you – Morkies are the best! He could go up to 18 pounds alright but he may stay around 15 pounds; but don’t worry about the size as long as he’s not fat. If you can feel his ribs and you see a tuck UP at his stomach – between the chest and tail, where his belly is, then he’s good. Snoopy is somewhat bigger than the “standard” Maltese and Yorkie but today, I see this urge to miniaturize our dogs and it’s very distressing. Unscrupulous breeders simply match sickly runt-to sickly runt to get the size down. I really deplore this movement because the dogs can have poor quality of life as a result; and the owner’s heart is broken by his constant illnesses and much shorter life. I’m so glad to read this!!! My Morkie boy is 20 pounds and 9 months old. The vet told me the same thing about Yorkshire Terriers being bigger originally. He is a happy, healthy & playful boy. ?? Hi, my morkie puppy just turned 8 weeks old yesterday (1/13/17) he currently weighs 3 pounds. I would like to know how much he’ll weigh by the time he is fully grown. Hi Ginna, thanks for writing to AboutMorkies. Your little Morkie will be pretty much at his full weight by 8 months old. Based on his birthday and current weight, my best guess is that he will be around 7 pounds or 7 1/2 pounds. That’s an ideal size; still tiny but sturdy enough to live a long life. Congratulations! We got our Morkie Oliver at 10 weeks and weighed 2.2 pounds. He is now 17 weeks and weighs 5 pounds. He has grown a lot too. I’m wondering how much bigger and when do smaller breeds slow down or reach height and weight size? Hi Beth – sounds like you’ve got a lovely, healthy little Morkie! Yes, toy dogs do reach their full size sooner than medium and large size breeds. By 10 months they are usually full-grown. My guess for Oliver is that he’ll weigh in around 7 to 8 pounds when fully grown (and in good shape) That’s a GREAT size. Adult dogs under 5 pounds have lots of medical issues, including the possibility of low blood sugar shock at any time when they’re cold, upset, haven’t recently eaten, and more. Plus Morkies (and Yorkies and Maltese) under 4 pounds are usually the result of runts bred to other runts, by unscrupulous breeders who know we will fall for a pet that’s super small. Not only is the super-small dog prone to mishaps like broken limbs from jumping off a bed, but he has other problems too and .. will likely not live as long as the proper weight dog. Yu should have many, many years with Oliver – 16 17 or even 18 is not uncommon. Thank you for your response. I am happy to hear Oliver is on the right road to be a healthy little guy! He is a Joy! I would recommend the breed to everyone. I am thinking about adopting a morkie. Are these dogs good with kids? Have y’all experienced a lot of health problems? 5 years sounds like a pretty short life expectancy. Can anyone give me a gauge on this? ?? A healthy, good size Morkie should live 12 to 15 years at least and it’s not unusual for them to go to 16! Yes I agree that 5 years is a very short lifespan, but this is an estimate basedo n experts’ experience – for super small Morkies – also known as “teacups.” When they are 3 1/2 pounds or less, they tend to be fragile from a health point of view, and not very hardy. Basically teacups are runts bred to other runts, that’s why. Morkies are pretty good with children. The only concern is, they’re small, and younger children can get overly excited and perhaps play too roughly. However, Morkies are very loving, loyal little dogs and like nothing more than tons of snuggling, so if that sounds like your kids, go for it! My dog is 10 months and was 8 pounds but is now 5 pounds. We don’t walk every day but at least 2-3 times a week. We keep him active in the house as well. I’m wondering why he has lost weight. Hi Dominique! Yikes that’s a lot of weight loss. In fact it’s nearly 40% – that would be like an average woman going from 140 lbs. to 84 lbs. real fast. First thing I’d recommend of course, is seeing your Veterinarian. Chances are this weight loss is caused by one of the more common causes, and they can be treated easily. They are thyroid, diabetes and anxiety. There are other causes of quick weight loss in animals, including liver disease, dental problems or parasites, but they are much less common. Dental problems shouldn’t be the cause in a 10 month old – this is usually the result of an older dog whose teeth have a ton of tartar, start to rot and are very painful. And thankfully, parasites (like that big tapeworm we all have nightmares about) are surprisingly, rarely the problem. Here’s hoping it’s one of the easier things to resolve, but do see the vet. and let us know how it goes Dominique. my dog is 3 pounds! her name is trixie! do you teach music? My Morkie weighs 1/2 a pound at 8 weeks. Do you know what she might weigh as an adult? Thank you! My best guess is 4 pounds – a really teeny tiny! My Morkie, Jackson is 3 and weighs 12lbs, he is such a little cuddle bug!! ? I was talking to another expert who feels your pup will be more like 9 to 10 lbs. My Morkie is 20 lbs but does not seem fat. Was I scammed by the breeder? At this point I don’t care cause I love my dog and wouldn’t trade him for the world! It certainly sounds like it, but im not an expert. No Carol I don’t think you were scammed…. 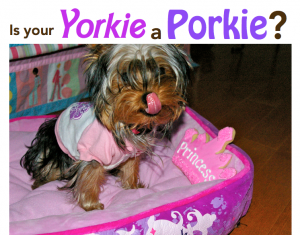 there just could have been a larger Yorkie or Maltese in your Morkie’s more distant past. As long as he isn’t overweight, it’s not problem at all. And in fact, you’ll find that he’s healthier than the super-small dogs breeders aim for today. The joy of Morkies is that every one is a little bit different! Until the Morkie has been bred Morkie-to-Morkie for a few dozen generations, there will always be differences. Best of luck and thanks for writing. My female morkie weighs just under 5 lbs at 17 weeks – however, she has SO MUCH fur that she seems a bit bigger. She is pretty small when you give her a bath! The perfect size!!! Sounds adorable! My morkie Jax is 14 months old and weights 9.5 lbs. I do think the treats need to be cut back a bit. His ideal weight may be 9 lbs. I keep Jax active and love him to pieces. My morkie just turned a year old he is now 8.5 lbs.he is very active!! That’s a great weight – not too big or too small. My tannish white morkie just turned 1 and weighs 12 pounds. But he’s not fat. I can feel his ribs and when he stand up, there’s a slight broad at his waist line but he sleeps alot more now than he did when he was a puppy. Ever since he was 4 months old.. My husband and I have always been taking him out for a run and biking with us every morning for cross training and he became very fast at running and can last up to 2 hrs plus.. but recently I’ve noticed that, that energy in him has changed. He’s not as active as he was before, after an hr of workout, He would be drained for the rest of the day. I’m not sure if this is because he’s getting older or he’s getting fat or it could be because we recently went on a trip for 6 wks and left him with my mom where he does nothing at all but sit around n gets pampered?! My Morkie is 4 years old and weighs 9 pds. She is always excited and when she begin to calm down. The older that she gets will she become calmer? My morkie Tango is black with a few black or grey patches and weighs 15 pounds but is not fat. Very informative. My morkey os 6 months old and weighs 7 lbs. I do think he is too large for his age.